This article is the fourth of a series of four that outline the meaning of the four suits of the tarot Minor Arcana. The suit of Coins corresponds to the North direction or wind; the Earth element; the Winter season; the Assiah or Manifest World of the Kaballah; the Malkuth Kingdom; The letter Heh (Completion of Energy into Form) of the Tetragrammaton; the female yin energy; the suit of Diamonds; The Path of Lakshmi and the Jungian function of sensation. It is also associated with the astrological signs of Taurus, Virgo and Capricorn. 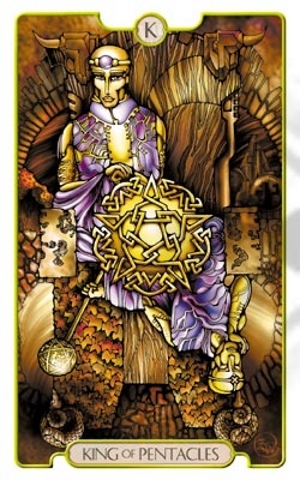 This suit represents the material aspects of our lives - our finances and possessions, accomplishments, manifestations, business, trade, land, home, our level of abundance. The Coins also represent our bodies, level of vitality, connection to the Earth and Nature, and our genetic heredity. Positive characteristics associated with this suit include our status in society, our personal values and our inner sense of self-worth. The Coins speak of our feelings of safety, our ability to relax and not fret or worry - to create, enjoy beauty and a zest for life. They also represent our strengths, talents, rewards for effort well-spent, and social/family support networks. Negative connotations include material loss, low self-esteem, pessimism, materialism, compromised values, stubbornness, inflexibility, and the practical concerns that make us worry. Is it a Coin or a Pentacle? 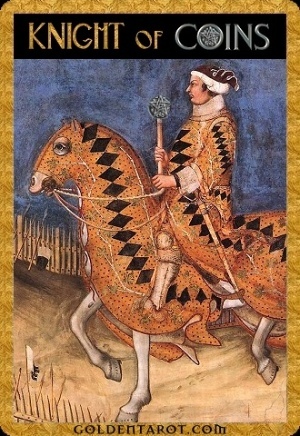 Like the other suits, various tarot scholars have called the suit of Coins by other names. This can be confusing to the new tarot initiate, but by now you are probably becoming aware that there are different schools of thought regarding the tarot, hence people from around the globe have chosen to give different names to significant tools, including the tarot cards. Often a symbol of either a large gold coin or a golden pentacle will adorn the 14 cards in this suit. 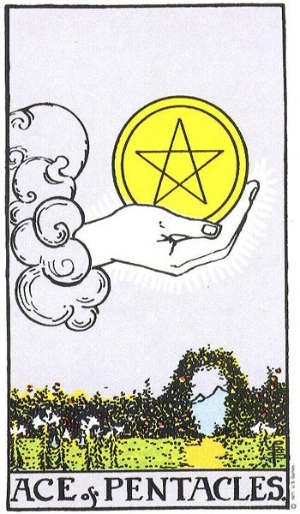 If you read or hear someone talking about the suit of Pentacles, Discs, Cash, Gold, or Diamonds - remember, that what they really mean, is the suit of Coins. A predominance of Coins in a spread signals attention on your manifestations in life - how you manifest through intention, planning and action to shape your dreams into reality. They speak of your ability to apply your talents, knowledge and physical abilities and build your own personal little empire. The coins represent abundance on all different levels. Not just your bank account, but also your socio-economic status, the home you are able to obtain, the lifestyle you are able to lead, the work environment that you enjoy (or not!). They gauge your climb up the proverbial ladder of life and indicate how well you hit the mark set by your own inner self. Every card has its down-side, and the Coins are no exception. For instance, the Ace of Coins indicates new financial and security beginnings and gain. An inverse Ace of Coins warns about becoming too wrapped up in the attainmernt of wealth and possessions - to reject the "keeping up with the Jones" approach to life. 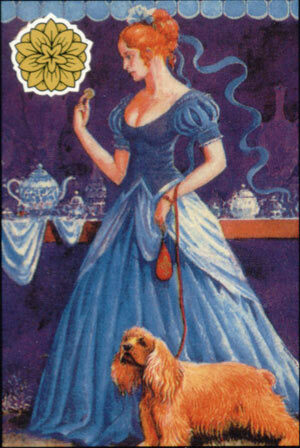 Greed, possessiveness and poor spiritual awareness are also indicated by this reversed card. It warns of discontent, anxiety and insecurity. When coins emerge in a reading, they point to the subtle yet powerful energy that helps us succeed in the third material dimension we call physical reality. Depending on the card drawn, they suggest ways to apply the will and intent to truly follow one's life path in a meaningful and prosperous way. Even the inverse cards provide guidance and warning on what to avoid in order to preserve our sense of security and safety in the world. This is of primary importance if we are to feel comfortable and motivated to try, to work hard, to "go for the gold" in whatever enterprise we choice to apply ourselves. No matter what the focus of the reading is: whether we have questions regarding romance, love, work, family, travel, career - the suit of coins can indicate how we should apply our personal power to achieve the goal, the intent of our focus. When learning to read the tarot cards, this is important to keep in mind., They don't always mean "money" or "coin" per se. They can be more metaphysical than that - and instead point to inner talent or "inner gold" - the power within us to shape our own destiny in a rich and effective way. TIP: Click on illustrations to view larger version for more detail.